The new Ninja Program WEB site here! Welcome to the ISB Google Apps Ninja Training Centre here you will find all the materials you need to become an ISB Google Apps Ninja Master. There are 5 essential ninja apps categories you must master to become a true Apps Master Ninja. To become a Ninja master in each area you must complete all of the ninja exams for each ninja coloured belt with an 80% or better accuracy. Black Belt: Must get at least 80% on the white belt and green belt test and 8/10 on the black belt test. 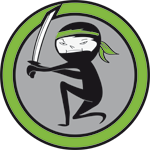 Master Ninja: Must get at least 80% on the white, green and black belt tests and 8/10 on the Master Ninja test. Are you ready to become an ISB Google Apps Ninja Master!